CHICAGO — Welcome to the outcomes business. As more than 15,000 executives and economic development officials gathered here Monday for the opening day of the annual Biotechnology Industry Organization convention, the talk was less about bringing safe and effective drugs to market than about improving health, keeping patients out of the hospital, and reining in costs in the United States and globally. 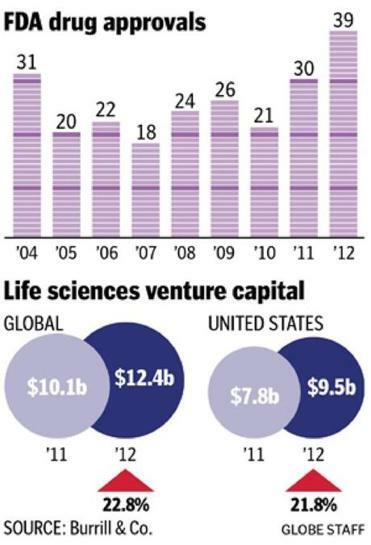 Most of the trends in the biopharma business have been upbeat recently. The number of drugs approved by the Food and Drug Administration hit a 16-year high of 39 last year, venture capital outlays for life sciences firms climbed nearly 23 percent, and many biotechnology stocks are trading at or near record levels. Despite those tailwinds, however, sweeping changes transforming the health care field have created a mood of uncertainty throughout the industry. The national health care overhaul, the shift toward personalized medicines targeting smaller patient populations, and tougher reimbursement standards by commercial health insurers in the United States and government payers in Europe are changing the game for biotechnology start-ups and pharmaceutical giants alike, Burrill said. The international collaborative will seek to advance research and development of new drugs, medical devices, and diagnostics. Drug makers once could count on a straightforward regulatory process and automatic reimbursement for approved medicines. But the process for getting experimental drugs to market has grown longer and costlier as regulators demand more patient-specific data before granting approval. At the same time, payment regulations have become more variable and less certain. Industry executives discussed the new dynamic at a Monday session on “pay for value” in the drug business, but there was little agreement on how to define the value of new medicines. “In God we trust, all others bring data” about how new drugs can be justified, said Lewis G. Sandy, executive vice president for clinical advancement at insurer UnitedHealth Group in Minnetonka, Minn. Sandy said health insurers are developing a new “hierarchy of evidence” for covering a drug. “Once we find it eligible for coverage, then we want to get the best price,” he said. Richard Pops, the chief executive of Alkermes PLC in Waltham, Mass., said payers should factor in the long-term cost savings from drugs such those sold by Alkermes, which fight alcohol and opiod dependence. Keeping patients sober and healthy can bring down health care costs and overall costs to society, he said. But the conversation is broadening to include patients, who have traditionally been excluded from reimbursement decision-making. “The patient really needs to be at the table,” said Robert J. Beall, the president of the Cystic Fibrosis Foundation in Bethesda, Md., which helped to fund a new drug developed by Vertex Pharmaceuticals Inc. of Cambridge, Mass. That drug, Kalydeco, costs nearly $300,000 a year per patient. While there has been little “pushback” from payers on Kalydeco, Beall said he worried about “the sustainability of current pricing models” for so-called orphan therapies — those that treat rare diseases. But Pops said insurers are more likely to balk at reimbursing new drugs to treat more common conditions, such as diabetes or cardiovascular diseases, because they cost more overall even if their price per patient is relatively low. That, in turn, is influencing what diseases biopharma researchers choose to focus on, he said. “There seems to be a mismatch between the great intellectual power we have and the diseases we’re addressing,” Pops said. To navigate those choppier waters, the industry has been consolidating — with venture-backed biotech start-ups striking alliances or being purchased by big pharmaceutical players hungry to get new drugs in their pipelines. But the pace of dealmaking slowed last year, according to Burrill’s figures, in the face of higher perceived risks. More than 25,000 “partnering” meetings have been scheduled between company representatives from every corner of the world at the McCormick Place convention center here, which is hosting this year’s BIO gathering. On Monday, the Anglo-Swedish drug maker Astra­Zeneca PLC said it has signed a partnership deal with Bind Therapeutics of Cambridge, Mass., to work on a new cancer treatment. AstraZeneca, which has a research center in Waltham, Mass., agreed to pay Bind upfront and milestone fees totalling $69 million, plus $130 million in payments tied to regulatory and sales goals for Bind’s lead drug candidate. There were more than 37,000 partnering deals in 2012 and 109,000 mergers involving mostly smaller biopharma companies, down from 2011. But the rising popularity of earnouts, a new financing mechanism that allows buyers to pay less upfront but more in contingent payments if drugs meet regulatory or sales ­milestones, could generate a larger wave of mergers and acquisitions this year, said Jeff Stewart, director of corporate development for the biopharma consulting firm Campbell ­Alliance in Raleigh, N.C. While earnouts were ­deployed in structuring some deals for year, their use ­increased markedly last year after French drug giant Sanofi ­incorporated so-called ­contingent value rights for a multiple sclerosis drug candidate as part of its $20.1 billion takeover of Genzyme in 2011. Correction: An earlier version of this story misidentified the first name of the president of the Cystic Fibrosis Foundation. His name is Robert J. Beall.